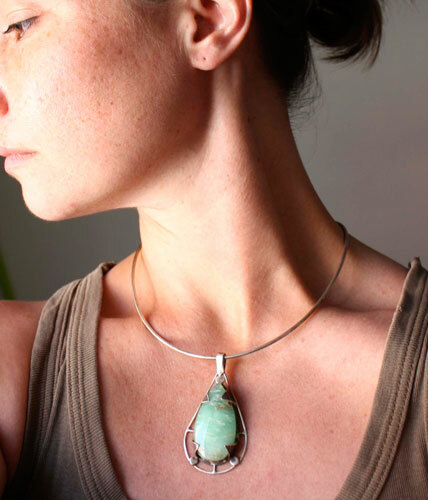 This pendant is inspired by the pre-Hispanic civilizations of Mexico and particularly the Aztec culture. Firstly, this stone pointed me to this reflection. 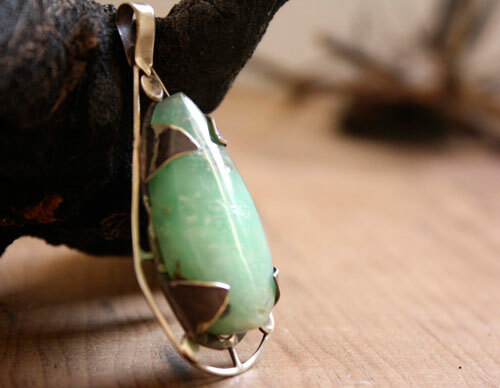 This chrysoprase drop-shaped, like the rain, shows shades ranging from blue to green. It is the color of the water that can be seen in the Caribbean Sea, on the east coast of Mexico. However, it is also the color of water that can be observed in the Cenote, these natural wells resulting from the collapse of the dome of an underground river. These locations were privileged places of worship to Tlaloc, the god of water. Tlaloc, like the gods of water from neighboring pre-Hispanic civilizations, was a fundamental god in a country that still fears drought. As water god, Tlaloc is the rain, lightning and agriculture. The Aztecs also called it Tlalocantecuhtli or "one who makes things run off" or "he who sows." 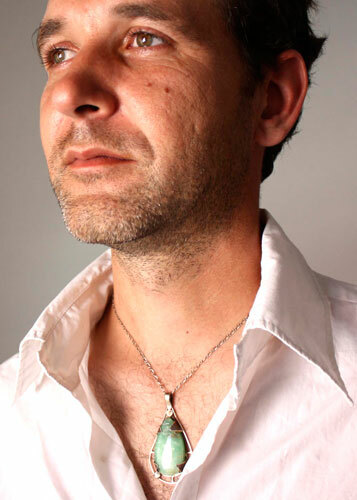 Therefore, I imagined a pendant rooted in the pre-Hispanic past and beliefs and modern at once to create continuity from that pre-Columbian civilization. This could be the massive pendant of an Aztec priest of the god Tlaloc or the magical and mysterious stone of the god, used to activate the rain and thunder, source of life and agricultural development. 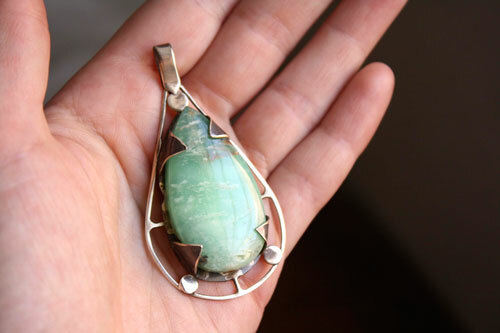 To do this, I set this chrysoprase on a silver sheet with triangular claws to free up the blue stone and evoke the fangs that can be found on the Tlaloc masks. A silver wire surrounds this raindrop shaped sheet, leaving breathe the crimping and giving it a modern and aerial side. 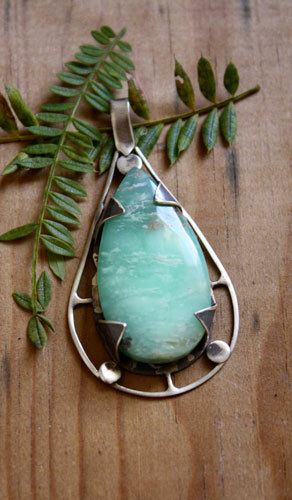 The back of the pendant is openwork circular shapes evoking the cenotes or puddles. 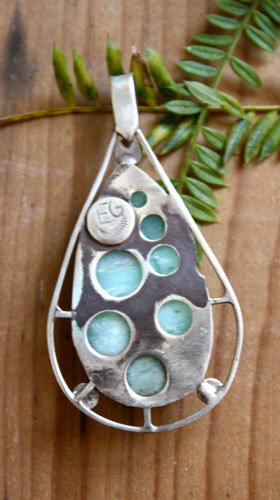 This pendant measures about 6 x 3.5 cm. 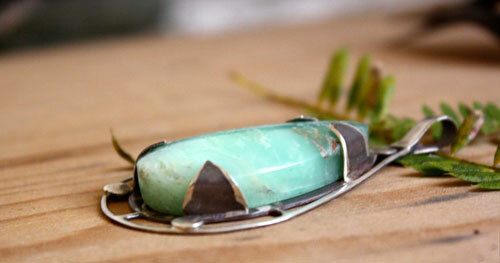 Tag: pendant, sterling silver, stone, chrysoprase, blue, islands, lagoon, peaceful, polished, drop, tear, romantic, oxidized, gift, anniversary, jewelery, unique, rain, god, aztec, spiritual, legend, Pre-Hispanic, symbol, pre-Columbian, water, Tlaloc, cloud, aerial, modern, tradition, storm, thunder, agriculture, life.